Edward Rutherfurd`s great Irish epic reveals the story of the people of Ireland through the focal point of the island`s capital city. The epic begins in pre-Christian Ireland during the reign of the fierce and powerful High Kings at Tara, with the tale of two lovers, the princely Conall and the ravishing Deirdre, whose travails echo the ancient Celtic legend of Cuchulainn. 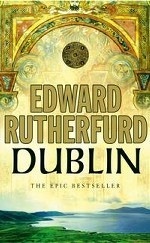 From this stirring beginning, Rutherfurd takes the reader on a graphically realised journey through the centuries. Through the interlocking stories of a powerfully-imagined cast of characters - druids and chieftains, monks and smugglers, merchants and mercenaries, noblewomen, rebels and cowards - we see Ireland through the lens of its greatest city.